These little vegan squash rosettes are completely vegan, so easy to make and INCREDIBLY delicious! Give your vegan party guests a little love with these precious, colorful appetizers. I’m not a vegan, but some of my favorite friends are, so I wanted to make some completely vegan treats for a little cocktail movie night! I made these little beauties for a vegan friend that comes to all of my parties and never complains that there’s nothing she can eat. She’s been a vegan for over a decade and always brings tasty vegan treats to share. 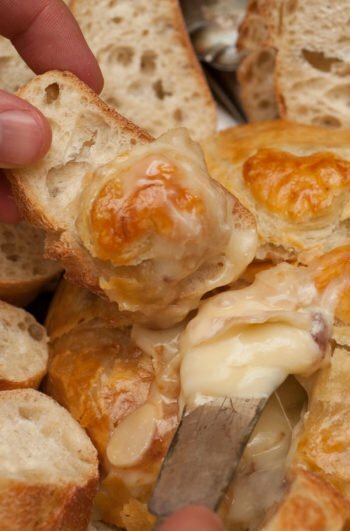 I simply wanted to make sure my friend wasn’t left out this time, but I had no idea they would be some of the tastiest appetizers I’ve ever made! I used a tiny cupcake tin so these could be eaten in one bite, but you can use the same recipe in larger tins to make tarts if you like. 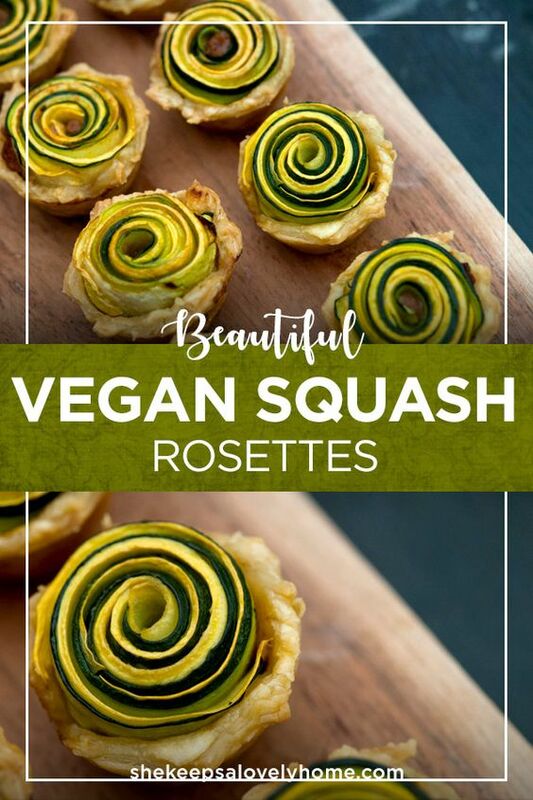 These little vegan squash rosettes are completely vegan, so easy to make and INCREDIBLY delicious! 1 can of refried beans - make sure to check if your brand contains lard. Some do. Grease a tiny cupcake tin with vegan margarine and line each cup with thinly rolled puff pastry. Add about a tsp. of refried beans to each up, and press evenly into the bottom with a spoon. Set aside. Use a potato peeler to make little strips of your green and yellow squash. Slice each piece down the center to make each piece half its size (if you’re making larger tarts, you won’t have to do that step – it’s just too keep things tiny). Melt a tbsp. of vegan margarine and add a half a tsp. of Sriracha and half a tsp. of Soy Sauce (or Bragg’s) and mix. Use your finger or pastry brush to brush the squash strips with your butter mixture, and lay each strip on top of each other, alternating the colors. Roll them neatly into a rose, and place them firmly into the refried beans in the puff pastry. Bake your little rosettes for 30 minutes. Serve hot. You’ll require a mini-cupcake tin and a potato peeler for this recipe. You can also substitute a little mashed potatoes! You could use either regular potatoes or sweet potatoes, just make sure to mash them until they’re nice and smooth! If you’re using regular potatoes, add a little sprinkle of garlic powder to them to make them extra tasty. And if you’re not vegan, you could also add some of the fabulous cheeses you have in Denmark! Enjoy!